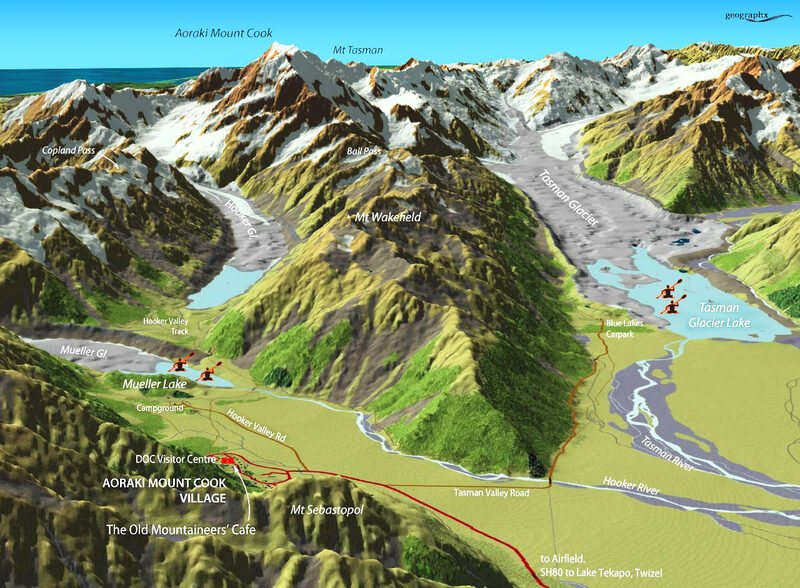 Southern Alps Guiding Ltd pioneered Heli-Hiking at Aoraki Mt Cook. Chief guide Charlie Hobbs with over 30 years of guiding experience, has explored every inch of the Tasman Glacier, and knows the best areas to visit on this incredible journey. Our trips involve small groups and personalised service. Our guides, Charlie and Ant, are the “legends” of Tasman Glacier Guiding and have vast amounts of experience and knowledge of the area. 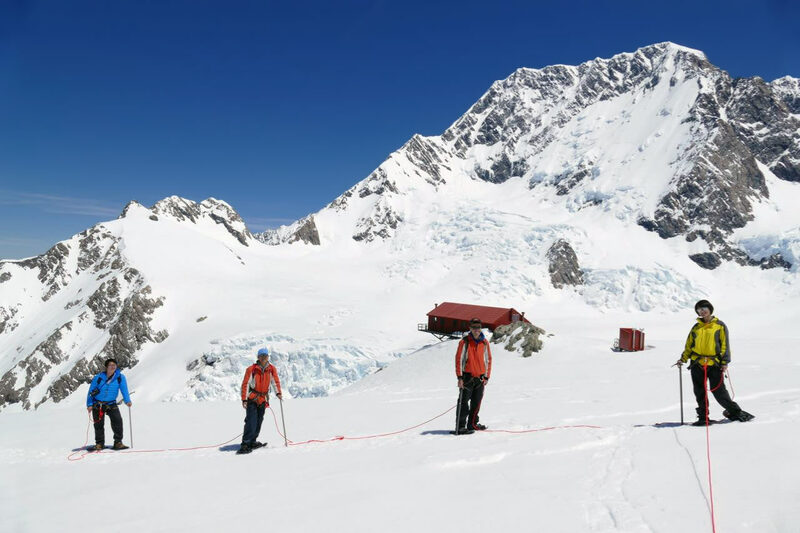 This fly-in, fly-out heli-hike combines the excitement of walking on the mighty Tasman Glacier and the excitement of two helicopter (or ski-plane) flights. By flying in, you are able to access and explore the white ice of the Tasman Glacier where it runs beside the biggest mountains in New Zealand and where the glacier's forces work hard often creating spectacular ice formations. 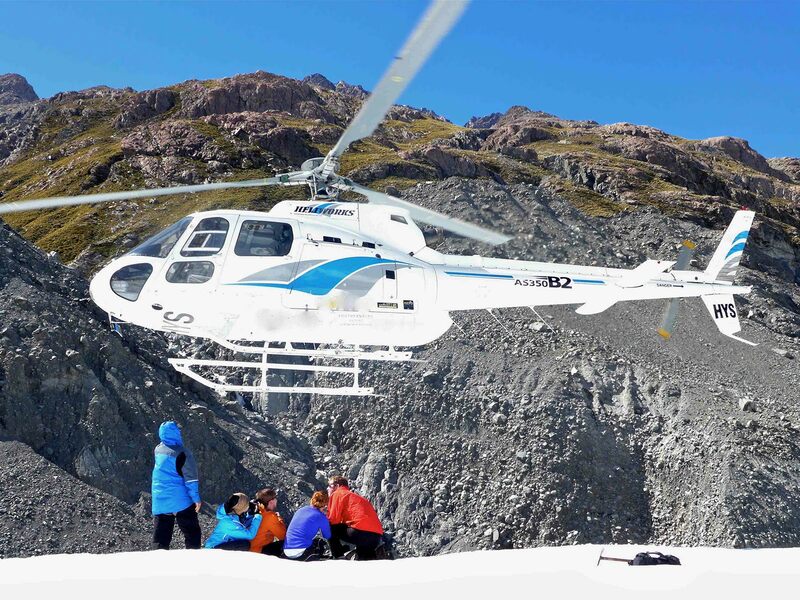 Equipped with sturdy boots and other equipment, you board your helicopter or skiplane for your flight over the icebergs of the Tasman Glacier Lake. Then you will fly past the famous Hochstetter Ice Fall and the east face of the mighty Aoraki Mount Cook. 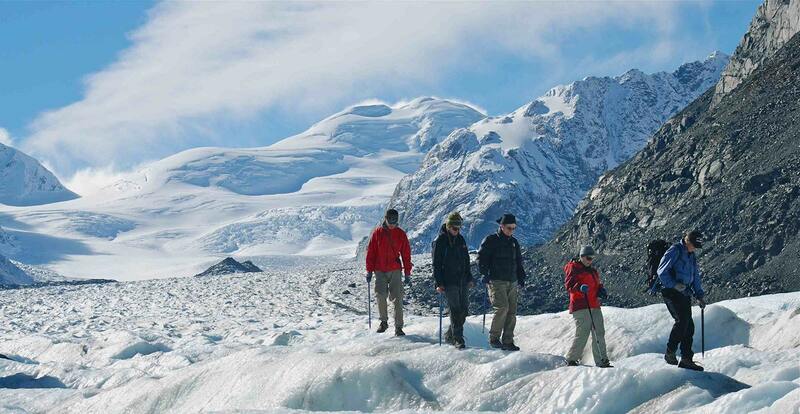 We then land on the Tasman Glacier where we begin our adventure and exploration on the ice. Your landing site is a remote and exceptionally beautiful part of the glacier. 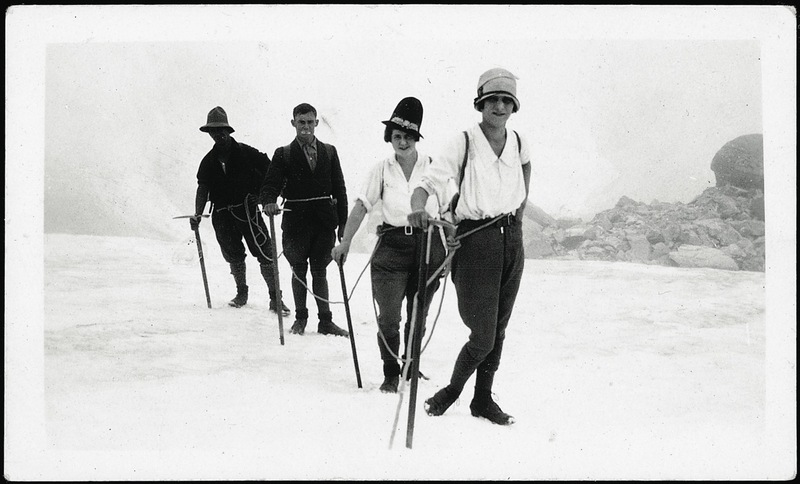 At this stage, your guide outfits you with crampons, specially designed for these ice conditions. 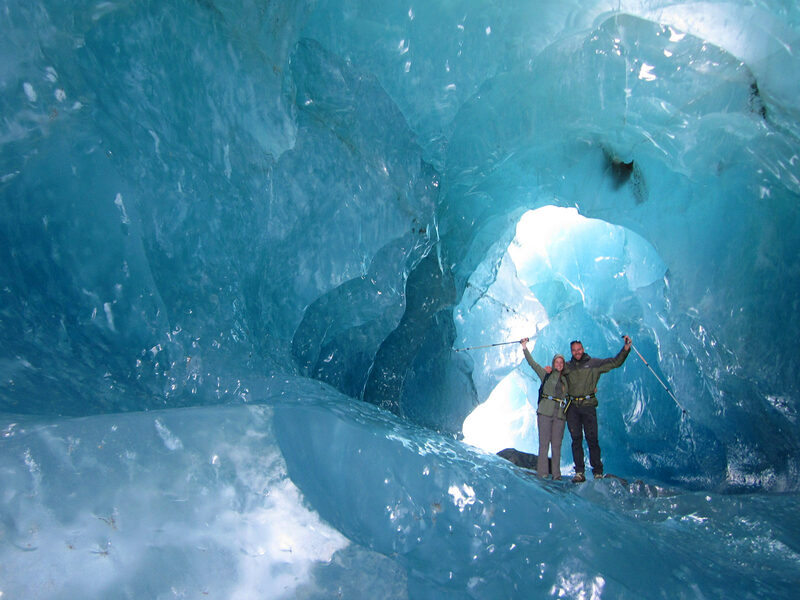 You will follow the ice steps cut by your guide as you explore the impressive ice formations and possibly ice caves. 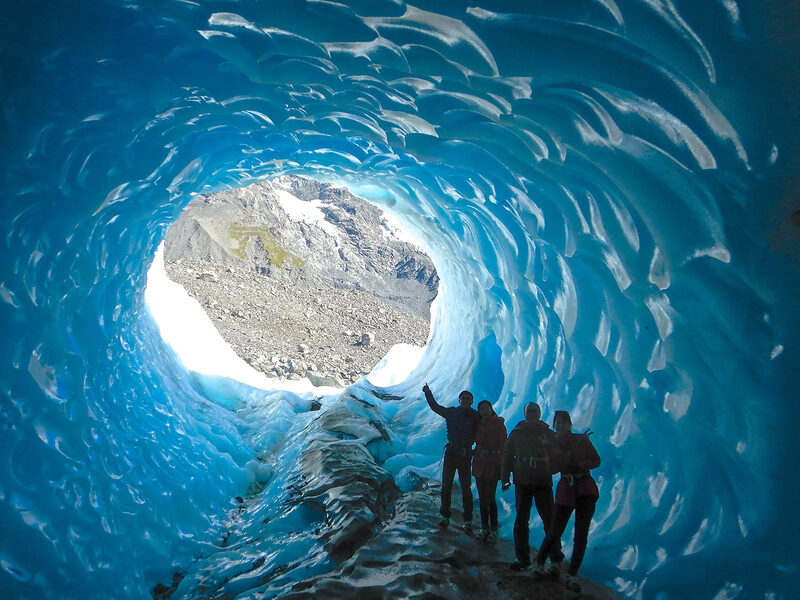 Yes, ice caves! We’ll explain the workings of the Tasman Glacier, how it flows, and what makes the crevasses and sink holes appear. We start at 9:00AM and 11:30AM (high season). There are so many exciting features on the Tasman Glacier! The scenery of the Southern Alps will impress you beyond expectations. Weather permitting, ice walking time is about 2 hours. Please note that this is a natural and ever changing environment. New ice features evolve constantly, therefore, no guarantee can be given that specific features will be seen. If conditions don't allow us to access the Tasman Glacier, we will do our best to access our other glacier locations so you experience an amazing day. Several layers of warm upper-body clothing. – we can usually get glacier-fed water from the ice pools! Your own boots (if you prefer). From the 1st of June 2019, $599/person. 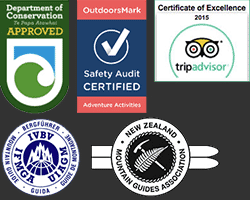 Includes: Two helicopter or ski-plane flights, guide, boots, crampons, and ice-axe/ski pole. 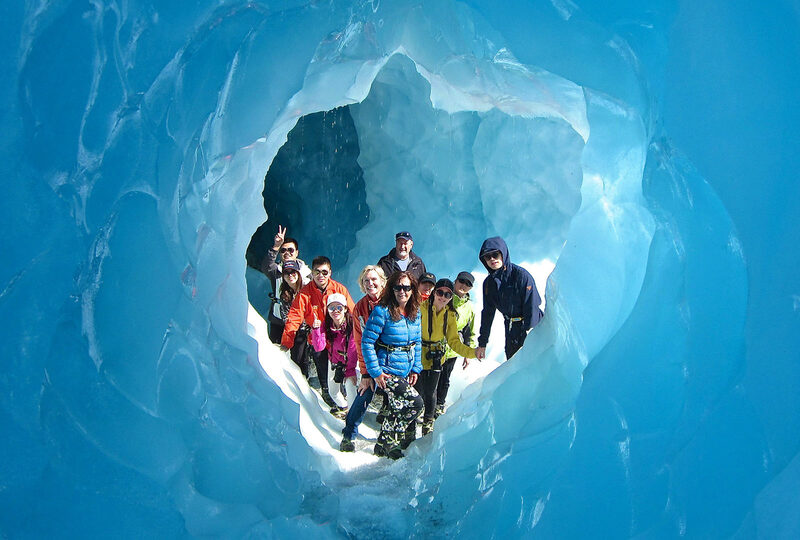 This is our famous trip heli-trekking on Aoraki Mt Cook and the Grand Plateau Glacier. The scenery will certainly hold you in awe! A spectacular helicopter flight landing right under Aoraki Mount Cook reminds you of the grandeur of the area. 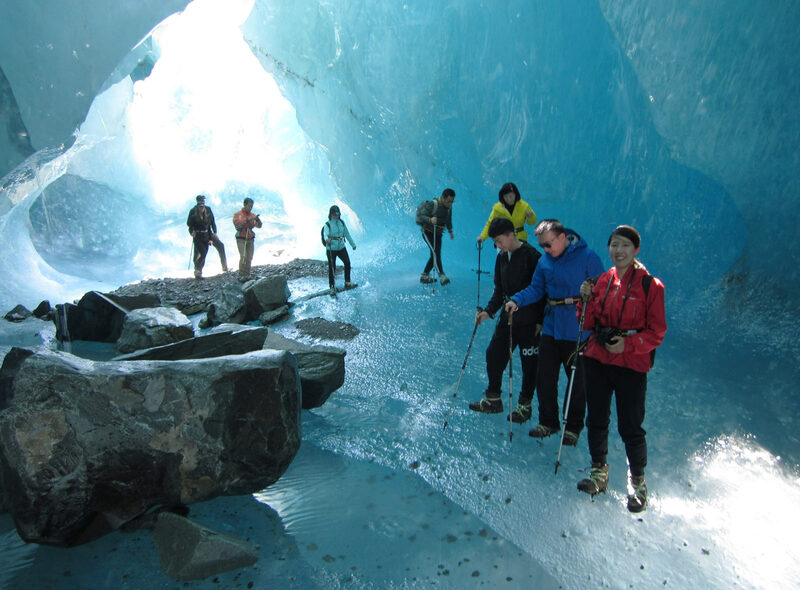 We have an exciting glacier trek on the flanks of Aoraki Mount Cook. 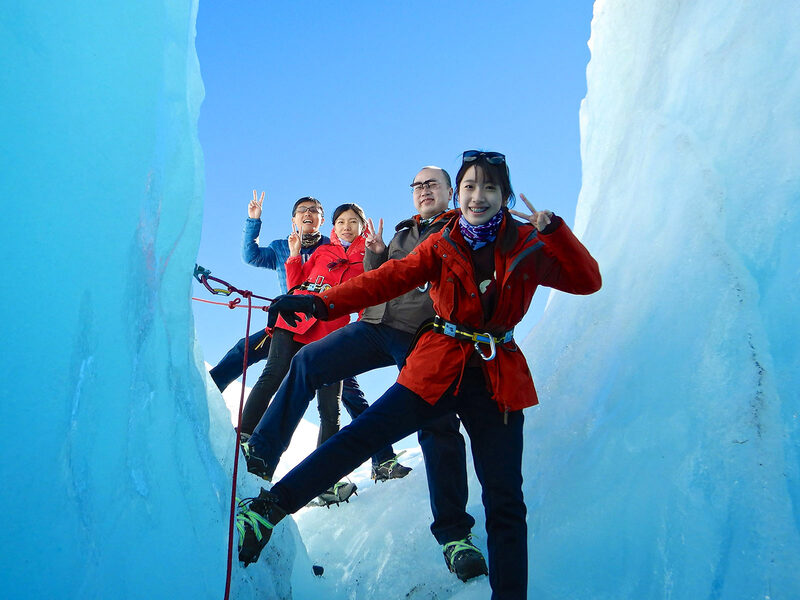 Your guide will show you how to rope-up for glacier travel. Then it’s time to trek to the Plateau Hut for lunch, and enjoy the great views through the maze of crevasses and amazing scenery. 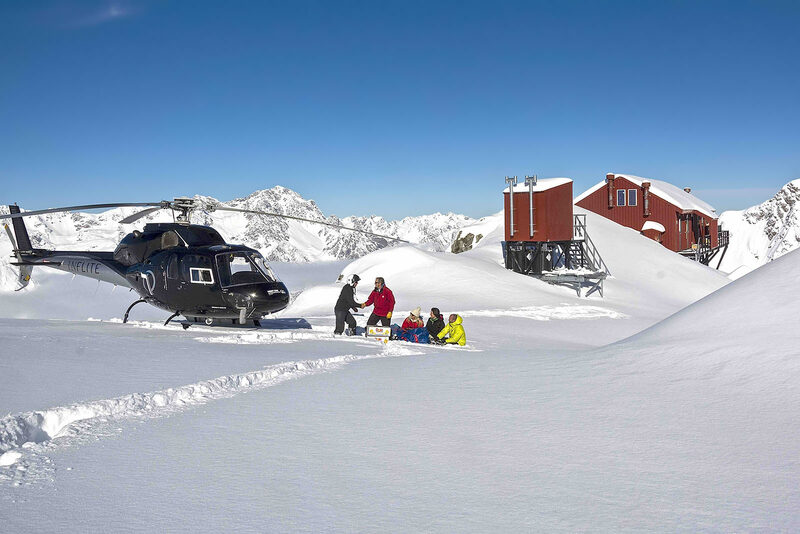 After lunch you'll enjoy another fabulous helicopter flight from the Plateau Hut to base with great views to finish this great excursion. Includes: Two helicopter flights, guide, boots, crampons, and ice-axe/ski pole. Join us on a beautiful one-day expedition to our remarkable destinations. Fly with your guide to either the famous Tasman Glacier, or the Grand Plateau, by helicopter or the famous Mount Cook ski-planes. 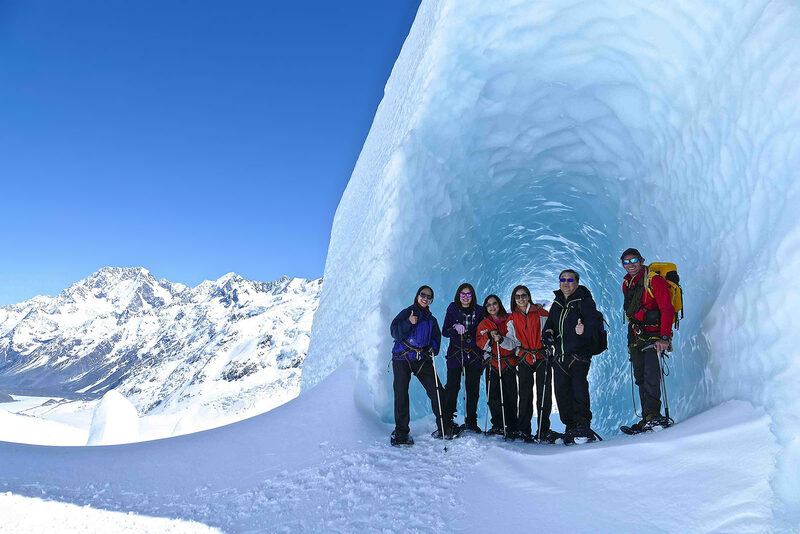 At over 7000ft or 2200 metres, enjoy spectacular views of the east faces of Aoraki Mount Cook and the vast expanse of glacial terrain of Aoraki Mount Cook and Westland National Parks. 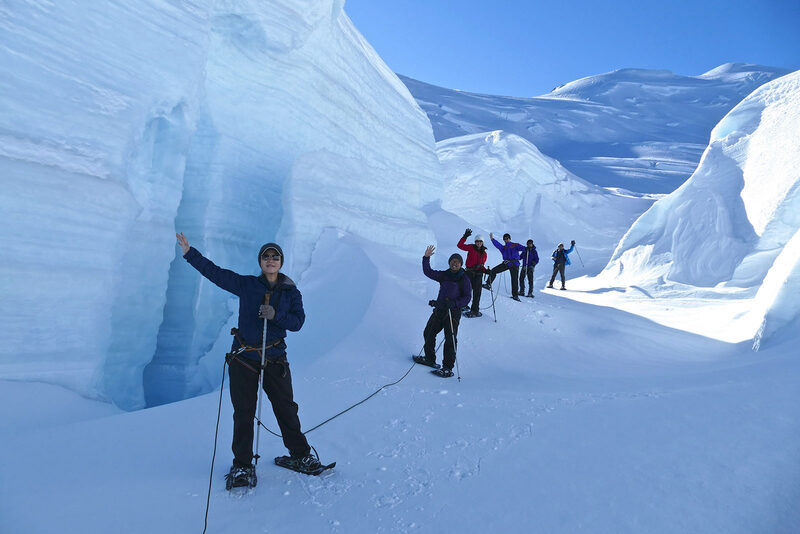 The guide will teach you some basic skills, then it is off on the adventure of a lifetime, trekking and hiking down the easy gradient of one of these mighty glaciers. 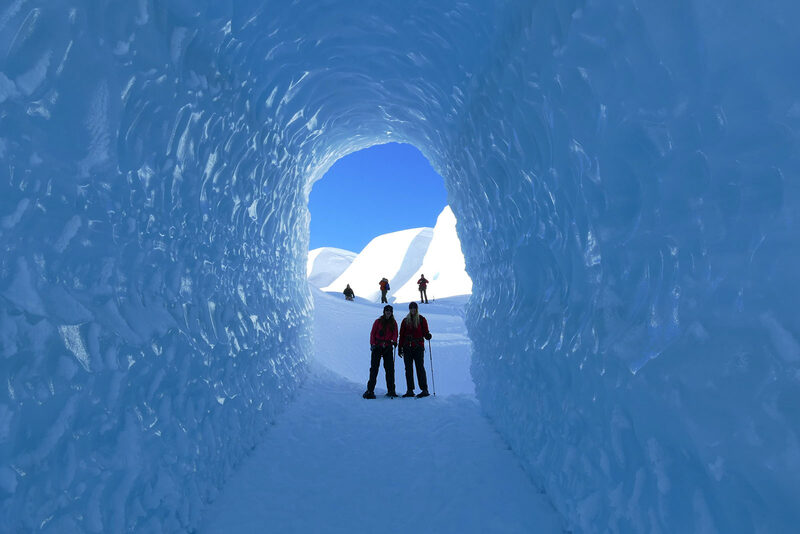 Along the way, we'll visit ice caves, view some very large crevasses and thundering ice-falls and even the occasional avalanche – all from a safe distance. We'll be trekking close to spectacular ice-falls. It is stunning scenery and an unforgettable day out. At the end of the day it's another spectacular scenic flight back to Aoraki Mount Cook airport and then we return to The Old Mountaineers' Café, Restaurant & Bar (and Historic Photographic Gallery), for some well-earned refreshments. Our glacier destination will be decided on the day after weather and snow conditions have been checked by your guide. These trips operate as private charters for private groups or families. Minimum of 4 people required (if you have less than 4 people in your group, we will do our best to put you on a trip with other people). Minimum age is 8 years old. Ask us for a price to do an exclusive tour. Includes: Two helicopter flights, guide, boots, crampons, and ice-axe/ski pole - and Lunch! There is a long history of glacier hiking here. We do our best maintain this tradition and look forward to sharing the experience with you. We close for the month of June, Christmas Day and Boxing Day. We reserve the right to cancel or change any part of any trip. This could be due to adverse snow, avalanche, mountain or weather conditions, or any other mountain-related scenario. We have a strict 36-hour cancellation policy, which means that if WE cancel the trip due to any of the above conditions we will give you a full refund. If you decide not to do the trip within 36-hours of the trip start time for any reason (you sleep in, have a vehicle breakdown, an unexpected illness, or injury etc.) or we cancel your booking because of client unsuitability due to poor fitness or health; there will be no refund. Please ensure you have travel insurance to cover all potential cancellation scenarios.